Did a French Kickback Lead to a Bombing in Pakistan? Photos: Sarkozy's Visit to the U.S. The car bomb that rocked the streets of Karachi, Pakistan, on May 8, 2002, claimed 14 lives, but its continued reverberations in France threaten to claim victims of another sort entirely. A new French book delves into the Franco-Pakistani military contract that took the 11 French nationals who died in the bombing to Karachi in the first place. And along the way, it reinforces some dark suspicions: that the attack was the deadly implosion of a complex kickback scheme that allegedly implicates some of France's top political leaders  possibly even President Nicolas Sarkozy. Written by investigative journalists Fabrice Arfi and Fabrice Lhomme, The Contract examines documents linked to the nearly $1 billion contract signed in 1994 committing France to selling three Agosta submarines to Pakistan. Those records, and interviews with people involved with the sale, confirm one previously reported detail: that the deal stipulated the payment of nearly $40 million to intermediaries for distribution to Pakistani officials who helped secure the accord. French laws didn't prohibit such kickbacks until 2000. What was illegal then, however, was the use of so-called retro-commissions, which involved skimming money off outgoing kickbacks for payment back to French officials  a setup that the book claims was part of the Agosta deal. More importantly, however, the book's premise dovetails with the leading theory in an official inquiry being carried out by French justice officials: that the Karachi bombing, which was officially blamed on jihadists, could have been retaliation by members of Pakistan's military and political elite who were infuriated by newly elected French President Jacques Chirac's order in 1995 to end the payment of kickbacks. "The official Pakistani conclusion that Islamist extremists were responsible doesn't stand up to scrutiny  and even Pakistani courts have acquitted everyone initially charged in the bombing," says a French security official with knowledge of the case. "The thesis that Pakistani officials finally decided to avenge themselves once they realized France really wasn't going to hand over money they'd been promised isn't established as fact. But it is the most plausible theory there is, now that jihadists are ruled out." That theory brings up a lot of questions, including, Why did Chirac decide to halt what were legal, contracted commissions destined for Pakistani authorities? According to The Contract, it was because he was unhappy about who was benefiting from the retro-commissions. The book  whose excerpts were printed Wednesday in the newsweekly l'Express ahead of a May 19 publication  includes interviews with former French Cabinet members who suggest that money from the Agosta deal was eventually paid back to fund the presidential campaign of then Prime Minister Edouard Balladur. 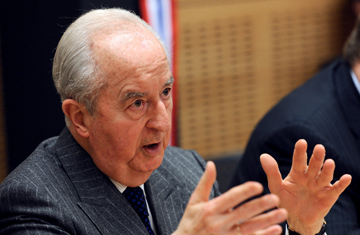 Balladur flatly denies those allegations. The context in which the allegations arose was Balladur's decision to surf his mounting popularity to run as a conservative rival to the right's standard-bearer, Chirac, in the 1995 presidential race. In doing so, he took with him the support of many lifelong Chirac loyalists, including Sarkozy, who served as Balladur's Economy Minister and, later, campaign manager. Furious at such a betrayal, the book says, Chirac, upon winning the election, sought to force Balladur and his backers into a political wilderness, and tried to further weaken any future challenges from them by choking off their finances. In responding to similar reports in the French press last week, Balladur said "nothing [in them] corresponds to the truth, and nothing is supported by facts," and refuted them as "a fabric of improbabilities and absurdities." When the inquiry into the Karachi bombing first brought up the theory last year that the attack could have been a reprisal for kickback payments having been halted  a theory that sparked media speculation that Balladur may have benefited from retro-commissions  Sarkozy hotly rejected it as "ridiculous [and] grotesque," asking, "Who would ever believe such a tale?"